I'm a fan of names that are somewhat under the radar but still have a solid history. I like names that were popular in the 1880's-1920's and never heard from again until modern times. I have been focusing on these for my "Name of the Day" report, and am doing so again today with the name Arlo. Primarily a boy's name, Arlo is short, sweet and full of character. Two celebrities recently named their sons Arlo, (Natasha Kaplinsky in 2008, and Toni Collette in 2011). Johnny Knoxville named his daughter Arlo in 2011, which suddenly throws this name into the "possibly unisex" category. (Popular girls names Harlow and Marlowe are similar, which may be the reason for Arlo going female.) It will always be a boy name in my mind since it has never ranked for a girl. It ranked in the 600-1000 range on the US Top 1000 chart between 1910 and 1944. It did not rank again until 2011 when it hit #916, and jumped 98 spots to #818 in 2012. If you read my previous post about trending boy names that end with the letter -o, you'll notice that Arlo was one of my "Names to Watch". I really think this one is going to boom up the charts in the next few years. Of Spanish origin, Arlo means "barberry tree", so it also puts it into the "nature name" category, which can sometimes be tricky for boys. Along those lines, Arlo would be a fascinating sibling for Jasper and Dahlia. 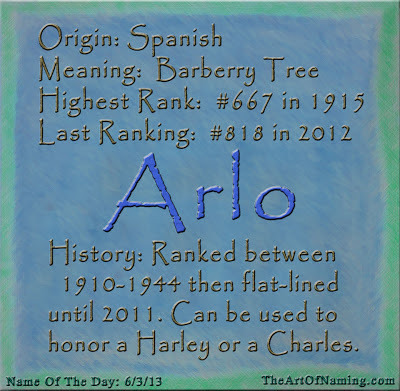 If you are looking to honor a relative, Arlo has also been known to be a variation of the following names: Harlow/Harley, Carlos/Charles, Arlene. It could also be spelled Arlow, Arlowe, or Arrlo. Because of this, the meaning of Arlo may be more relative to these other names. 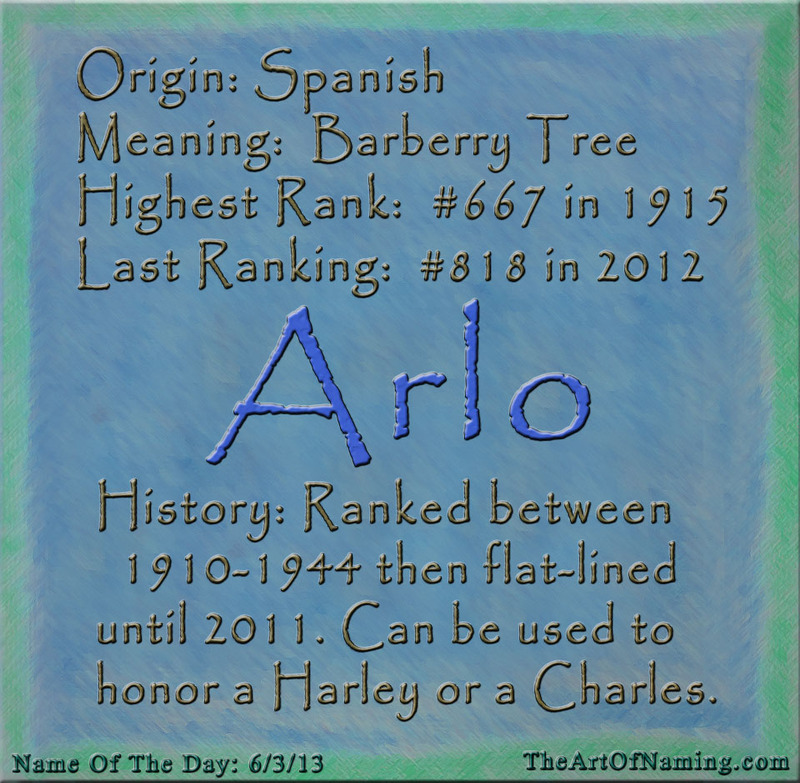 But as its own name, Arlo is indeed Spanish for Barberry tree. What do you think of this unique moniker? Would you use it for your son? Or do you see it better suited for a girl? Royal Baby Name Odds! What's Your Guess? Why is Elizabeth Perpetually Popular? Boy Names on a Girl?